Remove hooks with needle-nosed pliers or forceps. Using barbless hooks makes releasing trout much easier. 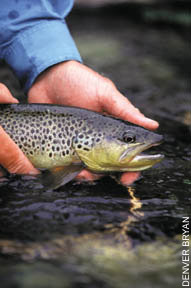 If a trout is hooked deeply, cut the line and release the fish. The hook will eventually dissolve, leaving the trout unharmed.